Then-President Barack Obama and former President George W. Bush at the dedication of the National Museum of African American History and Culture September 24, 2016. Image via Getty. Former presidents Barack Obama, George W. Bush, Bill Clinton, George H.W. Bush, and Jimmy Carter–bygone reminders of leadership with dignified hair–are holding a country-themed disaster relief benefit concert at Texas A&M this evening, and prettymuch everyone thinks Donald Trump wasn’t invited. It’s a concert to benefit people who’ve lost all their worldly possessions in Hurricanes Harvey, Irma and Maria, but naturally there’s president drama. NBC asked about it, and the White House didn’t return requests for comment. 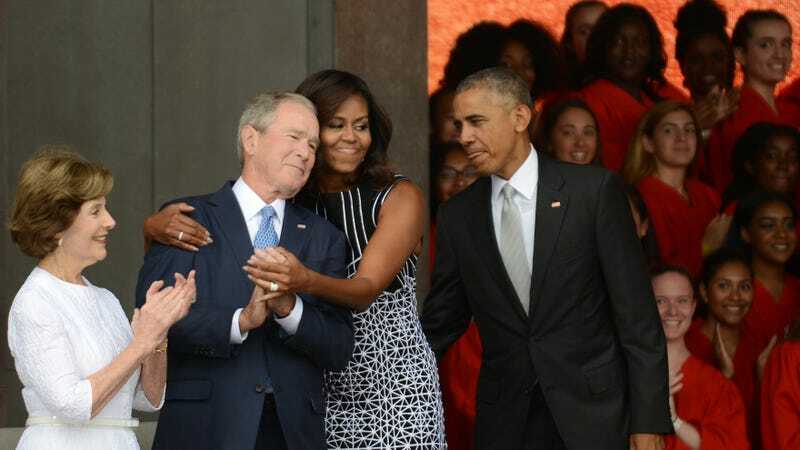 Barack Obama attended the opening of the George W. Bush Library in 2013, ABC notes, so it’s not like sitting presidents can’t hang out with former presidents. Trump made a thank-you video and posted it separately on the White House YouTube because it’s not a popularity contest or anything. We become the heirs of James Madison by understanding the genius and values of the U.S. Constitution. We become the heirs of Martin Luther King, Jr., by recognizing one another not by the color of their skin, but by the content of their character. Steve Bannon is weighing in, but who cares at this point. Trump has called himself the most presidential president since Lincoln (his favorite president), so even if he gets the message, there’s no love lost. The first press release for the event announces that the presidents have already raised money to ensure that “100 cents out of every dollar” will reach victims. The original plan was to help Harvey victims and depressingly expanded to include victims of Irma and Maria (though at the writing it still doesn’t include victims of the California wildfires). Funds will go to the Houston Harvey Relief Fund, Rebuild Texas Fund, Florida Disaster Fund, Juntos y Unidos Por Puerto Rico, and The Fund for the Virgin Islands. They will need as much as they can get; earlier this month, the House passed a $36.5 billion emergency funding bill, but in September, Texas governor Greg Abbott said that the state would need more than $125 billion. Yesterday, NPR reported that Puerto Rico may need $5 billion to restore power alone. You can donate to hurricane victims via the One America Appeal page, and in the absence of a wildfire charity, the Los Angeles Times has a useful guide for helping those victims as well. The event will be broadcast tonight at 8PM EST on One America Appeal’s YouTube page. The headliner is Alabama, with The Gatlin Brothers, Lyle Lovett, Robert Earl Keen, Sam Moore, Yolanda Adams, season three winner of “The Voice” Cassadee Pope and “rising country artist” Stephanie Quayle.